NEW YORK—Some artwork looks as good on a screen as it does in real life. Lisa Lebofsky’s artwork, however, must be seen in person. As daylight crawls across its unvarnished surfaces, the lightest parts become the darkest and shadows glow with a metallic sheen. Natural forms swing from reality to abstraction and back. Walk from one end of one of her paintings to the other and you will see mountains disappear and reappear—it’s not an effect that a photograph can fully capture. Lebofsky paints with oil on sanded aluminum panels, large areas of which she leaves unpainted. Working from her own photographs as references, Lebofsky applies paint in gossamer-thin layers, building mountains, trees, and glaciers almost as slowly as they form in nature, stopping from time to time to check how the light plays off the metal through the paint, or “melting” her landscapes with a fine spray of water. Lebofsky grew up just outside of New York City, surrounded by nature. From ages 6 to 16, she studied Chinese watercolor from a teacher who required her to read the “Tao Te Ching” and the “The Mustard Seed Garden Manual of Painting.” Her landscapes, in which empty space is a prominent feature, still reflects the aesthetic values of Chinese painting. It was not until college that metal came into the picture. She mastered metalsmithing in SUNY New Paltz’s undergraduate program and earned a BFA in the subject. She loved metal for its elusive properties, but realized after graduating that she is still a painter at heart. To further her painting skills, she studied anatomy and figure painting at the New York Academy of Art with the late Martha Erlebacher, who had a reputation for her unvarnished critiques of student work. Eventually teacher and student built quite a rapport, and Erlebacher became “one of the closest professors” Lebofsky had while she was at the Academy. One of the biggest lessons Erlebacher always emphasized was to consider objects’ physical forms as they exist in space—a principle that applies as much to painting trees and rocks as it does to painting bodies. This idea stays in Lebofsky’s mind as she works. With the training in metalsmithing and figure painting under her belt, Lebofsky’s first inclination was of course to paint figures on metal. But eventually the material led her to back to her first love— landscapes. “I found that nature motifs work best on aluminum because in nature there’s a subtlety of light that changes, and the metal parallels that change,” she said. Thus began her work traveling to and painting in desolate areas like Newfoundland and Antarctica. Then, just as her materials led her to the subject of nature, her subject then led her to her mission. “It’s very difficult in this day and age to create artwork about nature, particularly places like Antarctica, and not address climate change,” she said. The issue had been at the back of her mind, and people had suggested it to her as a theme, but Lebofsky wasn’t sure how to proceed with it. Then, a couple years ago, Zaria Forman reached out to Lebofsky. 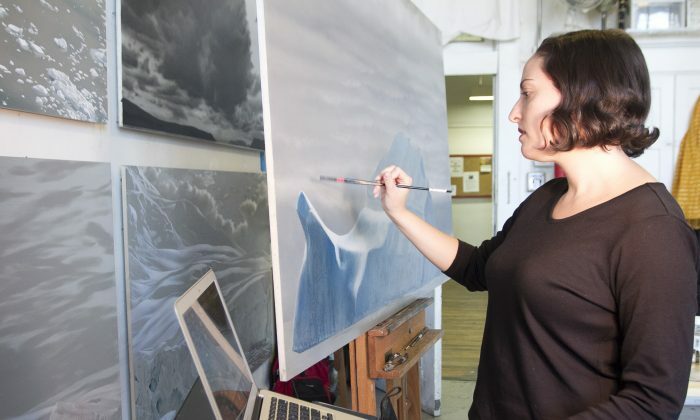 The New York-based artist, who draws with pastels, was looking for a painter to join her on a 2012 expedition retracing Hudson River painter William Bradford’s 1869 journey along the northwest coast of Greenland. Lebofsky and Forman had shown artwork at the same gallery, and Forman had seen Lebofsky’s solo exhibition of Antarctica. So Forman called the gallery director and, as Forman phrased it, asked if Lebofsky is the sort of person one would spend weeks with on a boat. The gallery answered in the affirmative, and a creative relationship began. This past summer they traveled to Labrador and then followed the melting ice to the Maldives, the first country expected to be submerged by rising sea levels. Consisting of group of atolls in the Indian Ocean, the Republic of the Maldives is the lowest-lying country in the world. During Lebofsky and Forman’s four-week stay there, they spoke to locals about environmental policy, waste management, and the way the country could change within their lifetimes. Some people shrugged off the issue, while others are proactively moving their families to more elevated countries, according to Lebofsky. Years ago, she created a series of paintings depicting victims of natural disasters. Now, instead of painting the effects of destructive natural disasters, she’s painting the cause. An organization in the Maldives that collects garbage from beaches has volunteered to send her a huge box of garbage. Lebofsky said she might make art out of it once she receives it, a move that would take her career deeper in the direction of advocacy. I asked her if climate change is what her art is about now.